All of the staff were super friendly, there was a great breakfast included every morning between 8 and 10, the room was comfy and clean, and the whole stay was extremely reasonably priced! After doing some sightseeing for a couple days, we hung out at their awesome pool for some downtime one afternoon, which was lovely. 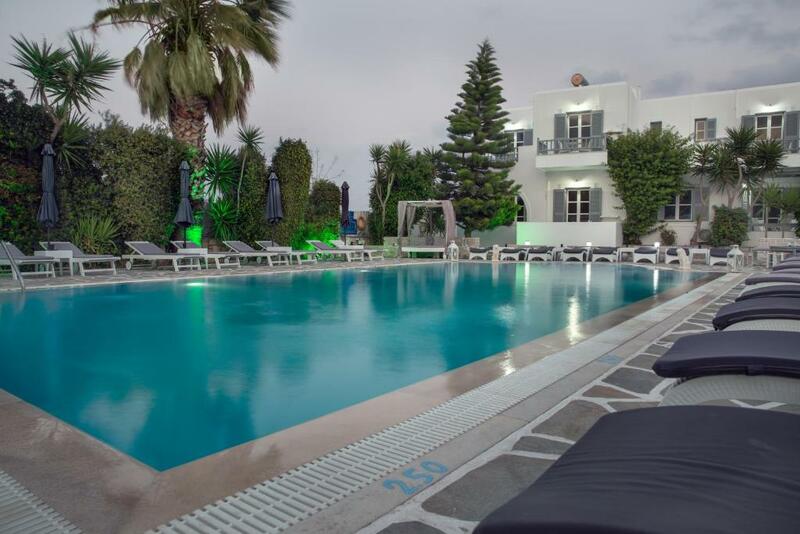 Zoumis Studios is located a short walk from Naoussa where there is everything a visitor could possibly want (rental car, shopping, restaurants, great ambiance). George (the owner) was fantastic and gave us great suggestions of things to do and see on Paros. In fact, he even drove us to the airport himself when it was time for us to catch our flight to Athens. If we are ever back to Paros, we'd be delighted to stay there! The property was beautiful. The rooms were nice and the pool area was fantastic. The room was very clean and we have really enjoyed the pool. The pool was very clean. George (the manager of the hotel and apparently also the King of Paros) was very helpful. The bus station is at 10 minutes of walk from the hotel. There are supermarket at 5 to 10 minutes of walk from the hotel. The "Moraitis Winery" is at 30 secondes of walk from the hotel. The old town is at 15 minutes of walk from the hotel. It is really calm during the nights. Perfect for a couple. I strongly recommend this hotel. Thank you again George. Well everything!! The room was perfect - big and comfortable, had a small kitchen (hot plate, fridge, kettle and sink with utensils, plates and even a pan), the bed was nice and big, we had enough space for all the suitcases (2 big and one small), the balcony was perfect with view to the pool and the sea. the only tiny minus was the shower itself that was pretty small and challenging. The breakfast was good - fruits, vegetables, cereal, cheeses and ham. The pool - beautiful and super-clean, the bar next to the pool is a great addition. The owner and staff - George the owner is very nice and accommodating, he gave us tips all along our vacation and answered every question with a smile. The staff is very nice and kind. The location - 5 minutes walk from a quiet beach and 10 minutes walk from Naoussa's center. Lovely grounds. Awesome staff. Owners are sooo nice. Perfect location, perfect host! Left my credit card at the property and the owner immediately sent it to my next hotel. Best service I have ever received from a hotel in my life. We spent every day at the pool. Our room was also next to the pool. I loved that we were a 10 min walk away from town which made it a quieter location but close enough to go out for dinner. The proprietors were great - very friendly, accommodating. I also liked that our 2 rooms opened up to a patio. The overall accomodation is really nice and very well laid out, with a lovely pool and bar/restaurant. The bed was really comfortable which is something I value highly and must say that whilst on holidaying in a variety of accomodation in Crete, Santorini, Paros and Mykonos every single bed I slept in was great. My room was at raised ground floor level which had pretty much everything I needed and the balcony faced onto the pool area that also had some privacy. George and his sister, young owners of the hotel run the business together and hats off to them as they work really hard to ensure every guest has a great stay. I was picked up on my arrival and drop back on my departure from the port at no extra charge which was an added bonus for me that I appreciated. George was extremely helpful with directing my to a bicycle hire place and giving me general information on places to visit like the best beaches and also where to buy essential groceries. Lock in a great price for Zoumis Studios – rated 9 by recent guests! 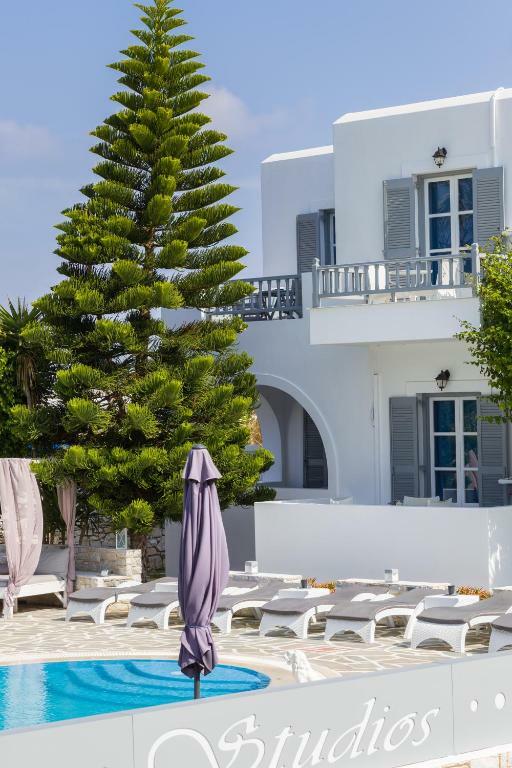 One of our top picks in Naousa.Just a few feet from Agioi Anargyroi Beach, in the lively town of Naousa, Zoumis Studios offers self-catering accommodations with air conditioning and free WiFi. 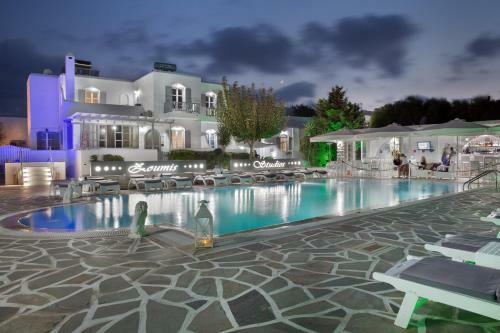 It has a pool with a large stone-paved sun terrace and a poolside bar. Zoumis studios and apartments are simply, yet traditionally furnished, and some have a balcony with views of the pool or the Aegean Sea. They feature a kitchenette with hobs and a small dining area, and they also have a TV with satellite channels. Guests can start their day with a full English breakfast, and later enjoy refreshing drinks, coffees and light snacks by the pool. BBQ weekends are organized regularly, while room service is available on a 24-hour basis. 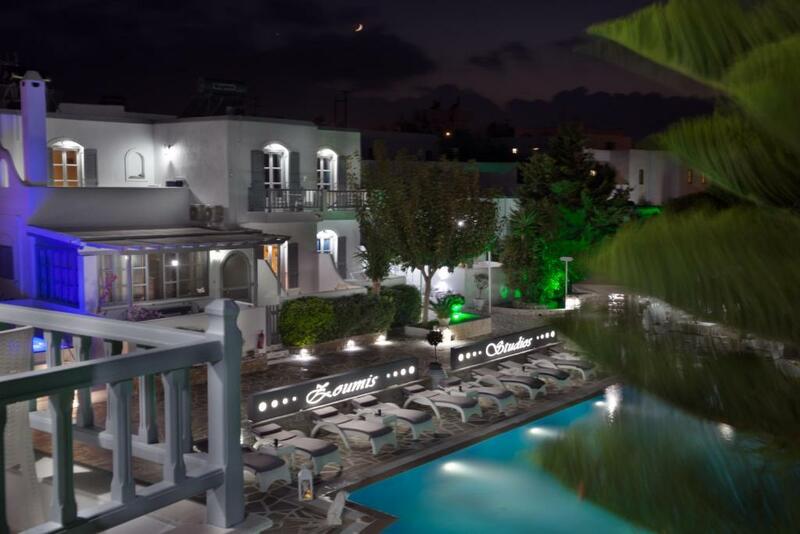 The center of Naousa is 1,650 feet away and offers a wide choice of traditional taverns, bars and nightclubs. The port of Parikia is at 6.2 mi. Free private, on-site parking is available. This property is also rated for the best value in Naousa! Guests are getting more for their money when compared to other properties in this city. 뀐 Located in the top-rated area in Naousa, this property has an excellent location score of 8.9! 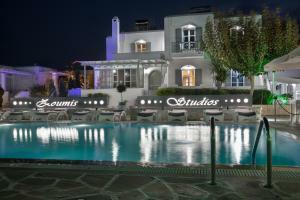 When would you like to stay at Zoumis Studios? Offering a kitchenette with hobs and a TV with satellite channels, this air-conditioned studio features free WiFi. An iron and a safety deposit box are included. Some units come with pool or Aegean Sea views. Including 2 separate bedrooms, this spacious and air-conditioned apartment is fitted with a kitchenette with hobs and a TV with satellite channels. It offers free WiFi access. An iron and a safety deposit box are included. This apartment cannot accommodate an extra bed. The Zoumis Studios *** is so near from the beach Agioi Anargiroi and from the center in Naousa Town. The service of the Hotel is the best and very kind. All the people how work in Zoumis Studios is very near to the customers and we are help them for everything. Please visit us to leave the Greek experience..!!! The Hotel Manager in Zoumis Studios , George Zoumis is very near to the customers. When the customers arrive in the Hotel he explain you everything from Paros island. He give you the way to visit the island and how you can see the best local thing in Paros..!! The place near to Zoumis Studios has the sea Agioi Anargiroi beach , has beautiful Hotels , super market and the street how go to Naousa Town. House Rules Zoumis Studios takes special requests – add in the next step! Zoumis Studios accepts these cards and reserves the right to temporarily hold an amount prior to arrival. There were just a few small issues that I discussed with George at the end of my stay, i.e. that I felt there needed to be a little more cooking equipment, the toilet did not flush properly and things like towels did not seem to dry properly which also seemed to be the case if I tried to do this in the bathroom/studio area though could be due to the location of my room and that it didn't seem to get much sun. It was right at the end of Sept beginning of Oct so this could have had some impact on this. One other thing that struck me which I did not experience elsewhere in other accomodation I stayed in was that there was a mini bar that provided quite a lot more than normal. So this allowed little space in the fridge for any supermarket groceries and made me a little confused as to whether I was staying in a hotel or self catering with the cooking facilities. I couldn't really see how this was good for business and asked if the mini bar didn't really make money then suggested it might be an idea to rethink this provision. Having mentioned all the above, what impressed me was that when I shared my experience with George he was appreciative of the feedback and expressed that he and his sister are working towards bringing every room up to the high standard they want for their guests, explaining that this is an ongoing process like for any hotel/holiday apartment business and he was aware that some rooms were in need for refurbishment going on to say that this would happen in the coming winter months. Please understand that my comments are not complaints just feedback, as I want George and his sister to thrive because I can see how much time and effort goes into running their business and that's why I have given Zoumis Studios a score of 10, so very much look forward to returning. Lovely pool and bar, comfy rooms. We loved Naoussa village. Good rooms & nice pool area. Close to a beach and to Naossa with lots of good restaurants. Staff all very friendly & helpful too! We had a wonderful stay at this place. The owner George was very helpful with all the questions we had. Also the staff was so very nice and friendly with us and the kids. Beautifully clean. 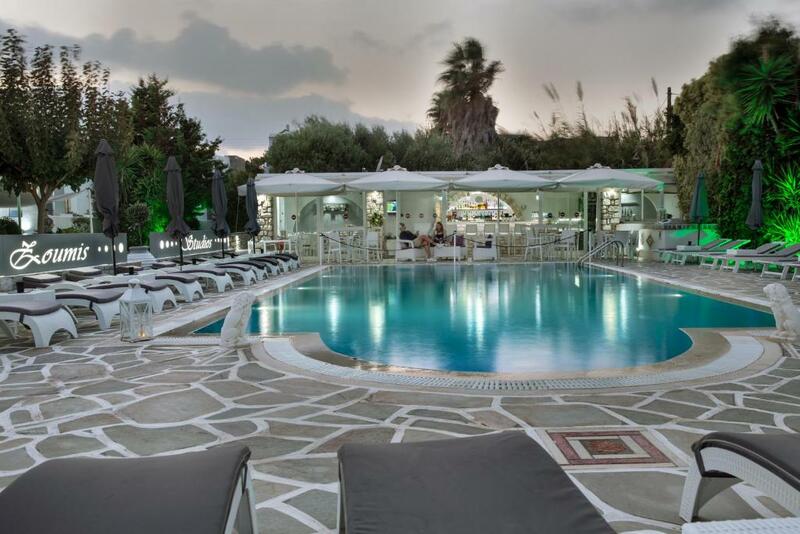 We loved the pool area and the relaxed atmosphere of the pool bar. Great Music 😊. Also a very leisurely 10-15 minutes walk to the township which is very beautiful. Lovely staff. Very nice place to stay also for kids. Good breakefast. The pool looked nice but was too cold the time we were there. Free shuttle service to and from the Hotel to the ferry. To be a bit nitpicky, bathroom and specifically shower plate are quite outdated, but for the price it was correct. Staff (like everywhere in Greece) was really helpful and room was perfectly clean. 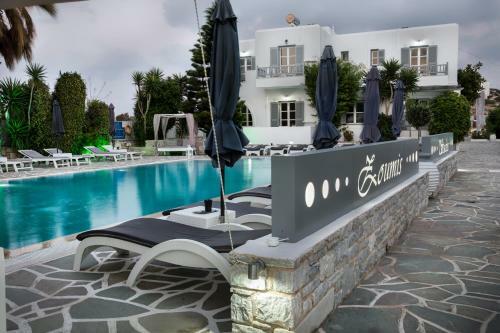 Hotel was within walking distance to main attractions in Paros. Its a bit far from the main area..but the staff was really good and helping. Everything else was awful. I was travelling with my family and I book for a triple room. They gave us a very small room where we could hardly move (nothing like the one I saw in the pictures) . The bathroom was horrible, very very old. You couldn't open the door without hitting the toilet, the towels were very old and broken and the shower (you can not imagine). It had a balcony were only one person could go out. The room was in front of the swimming pools (the only thing is the view was nice) and the bar. But after the first night, we couldn't sleep there because of the bar music and people talking. We complain and it hardly took effect. Travelling for so many hours with a baby and we couldn't sleep. The next day the owner told us to change us but he didn't do it until the 4th night, so we had to stay in that horrible room for 3 nights of 5. When they finally change us the room, they move us to a chalet with more space (this was the one that I actually book online, the one I saw in the pictures) but again the facilities weren't nice, the shower and toilet were leaking, so every time going into the bathroom you were getting your feet wet. The personal weren't as nice as I thought, and for example the breakfast, they were closing at 10:30 but if you were still there they were getting everything away at 10.30 sharp. Not like other places that I have stayed that they tell you are going to close but don't take the food away immediately. Also the bar, it says they have food but what they won't tell you is that you have to pre-order the food in advance otherwise you only have sandwich and snacks. So, we couldn't have lunch any day with our daughter after being in the swimming pool because I needed to feed her properly (not only sandwiches). So we were going to another hotel nearby, in front of the beach that they also have bar and restaurant and it was very nice and the personal very very friendly. Only the swimming pool was nice. GO TO OTHER hotel. There is one very nice with swimming pool and bar, restaurant in front of the beach much better. Location is out of town. A bit of a walk to get to restaurants, shops and bus station. We love Zoumis!!!! 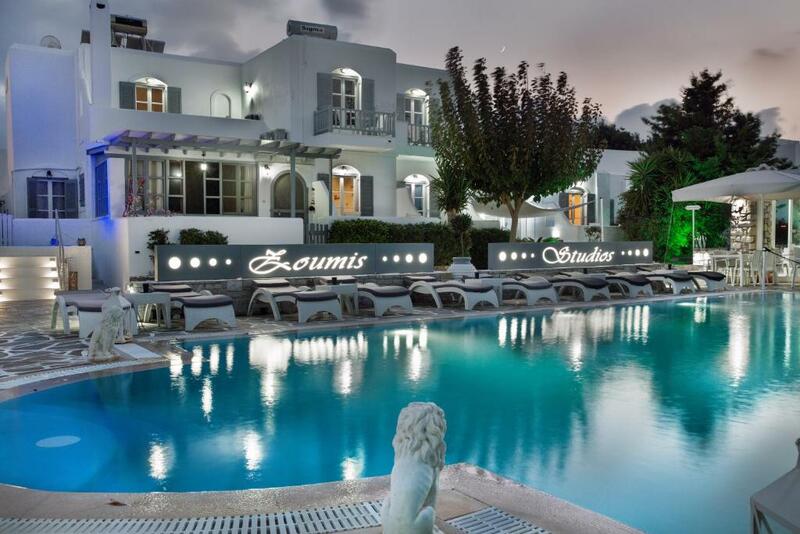 My friend and I stayed at Zoumis for 4 nights in early September and it really was great, we loved it so much we barely left Zoumis! The staff are so welcoming and helpful and it has a nice relaxed family feel to it. The location is perfect it’s under a 10 minute walk to the main town with all the restaurants and shops. Facilities were good, for a 3* we were surprised at how good, it had everything you could possibly need. We couldn’t recommend Zoumis highly enough, thank you George for such a great stay!!! Great pool, great location, decent size rooms.